Laminate wood floors have been gaining in popularity over the last few years. Why? Laminate wood floors used to have a bad reputation as a low-quality flooring option. As an artificial option, these floors used to be known for their obviously artificial aesthetic. But laminate wood floors have come a long way since those days. Modern technology and state-of-the-art manufacturing techniques have made laminate panels more realistic-looking than ever before. This has contributed to laminate’s growing popularity among homeowners. In addition, laminate wood floors offer clear benefits that may be worth considering for your next wood flooring project. Here are three reasons laminate wood floors are getting to be so popular nowadays. Many areas of the house take a lot of foot traffic every day, so the floors in these areas need to be able to withstand daily use and abuse. This foot traffic can cause wear and tear to the flooring and require frequent cleaning to retain its beauty and longevity. Laminate wood flooring is built to withstand this daily wear and tear. It is strong, durable, and easy to maintain and clean. This makes laminate a great choice for high-traffic areas such as kitchens. If you’re the type of homeowner who doesn’t have much time to spare to care for your flooring, you might balk at the prospect of a wood floor that requires more attentive care than most. 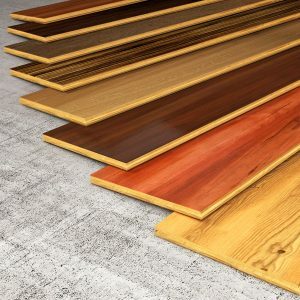 Some wood flooring options do require special polishes and other care techniques to keep them in great shape. Laminate wood floors, on the other hand, don’t require much in terms of maintenance. Usually, cleaning requires a simple sweep or mop with a gentle cleaner – that’s all it takes to keep laminate flooring looking sharp every day! Other artificial floor types, like traditional laminate and linoleum, can fall victim to staining and fading over the course of normal use. Laminate wood floors do not, and will easily retain their aesthetic over the years. This entry was posted on Friday, June 9th, 2017 at 10:55 am. Both comments and pings are currently closed.